An aquatint in original colour by George Hunt after the drawings of Henry Alken, published at 24, Haymarket, London by Thomas McLean in 1824. 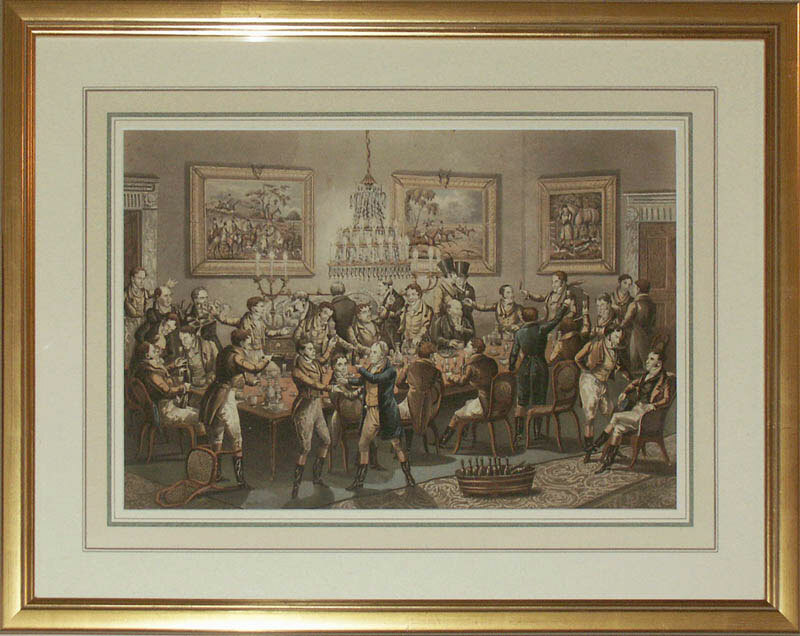 This wonderfully evocative print depicts a raucous dining scene within the confines of a Gentlemen’s Club. A loyal toast has been proposed but the dinner guests are far from attentive. Many are busy with their own affairs and the wild gesticulations of one particular guest upset the waiter’s tray as he enters the room. Equestrian scenes adorn the walls and a magnificent chandelier lights the proceedings. George Hunt was one of the most prolific and successful aquatint engravers working in London during the early to mid-nineteenth century. Henry Alken’s reputation was already secured as one of the most accomplished sporting artists of his day so this particular print represents a wonderful collaboration of talent.